Raumfahrt+Astronomie-Blog von CENAP - Blog: Raumfahrt - Buzz Aldrin: Raumfahrtprogramm sollte Brücken mit anderen Ländern bauen, vor allem China. 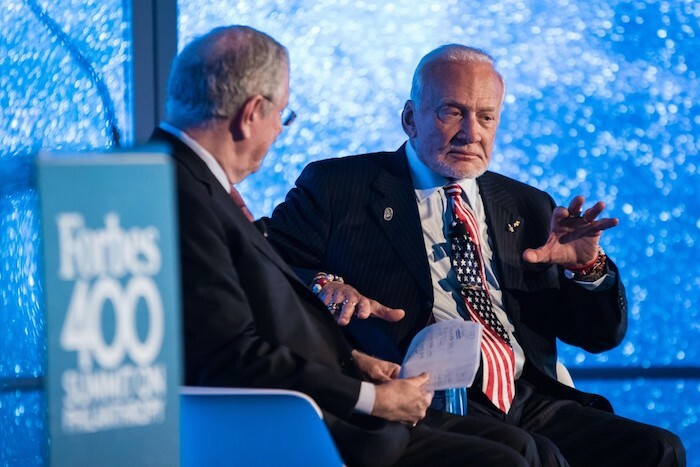 Astronaut Buzz Aldrin thinks Congress needs to stop inhibiting the space program and the government should quit trying to compete with the private sector. Instead, it should leverage the space program to build bridges with other countries, especially China. Aldrin, who almost half a century ago made history with Neil Armstrong when they became the first two men to set step on the moon, has more recently been devising a master plan for missions to Mars . He says that with reusable landers and less clunky rockets, we should be able to create a new and better Apollo mission. At age 86, Aldrin has enjoyed a career spanning flying jets at war zones to making historic space travel. He says his career choice was almost inevitable given the household he grew up in: his father was an Air Force colonel and his mother’s maiden name was Marion Moon. Aldrin earned his bachelor degree in mechanical engineering at the U.S. Military Academy at West Point before joining the Air Force and he was a fighter pilot in Korea and Germany. He then went on to earn his Doctorate Of Science in Astronautics at Massachusetts Institute of Technology. Upon his famous moon landing on July 20, 1969, Aldrin said he was forced to think up a low-tech solution to a broken circuit. When ground control in Houston said it didn’t have a solution he used a ballpoint pen to fix the circuit and the rocket was soon cleared for take-off. After his return to Earth, Aldrin traveled the world basking in awards and newfound celebrity. Yet when the whirlwind accolades trickled down and he faced retirement, he was caught off guard.